We are finally seeing a movement by the general business world to seriously focus on the role and value of employees, which is why “Embracing Employee Engagement” is one of our 2017 CX Trends. Temkin Group has viewed employee engagement as a critical foundation for customer experience since our inception. It’s one of our Four CX Core Competencies. While the trend is great, there’s still a long way to go. I’d love to see many more human resources organizations recognize that employee engagement is one of their strategic objectives (see my post, HR Execs: Wake Up To Employee Engagement!). As this area has gained attention, there’s been a troubling misunderstanding creeping up in the dialogue. People are confuscating Employee Engagement with Employee Experience. They are not the same. Lyddy, Christopher, and Darren J. Good. “Being While Doing: An Inductive Model of Mindfulness at Work.” Frontiers in Psychology, vol. 7, 2017, pp. 1-18. Full text. Abstract. Mindfulness at work has drawn growing interest as empirical evidence increasingly supports its positive workplace impacts. Yet theory also suggests that mindfulness is a cognitive mode of “Being” that may be incompatible with the cognitive mode of “Doing” that undergirds workplace functioning. Therefore, mindfulness at work has been theorized as “being while doing,” but little is known regarding how people experience these two modes in combination, nor the inﬂuences or outcomes of this interaction. Put Culture Change On Your 2017 CX Agenda. Here’s How. 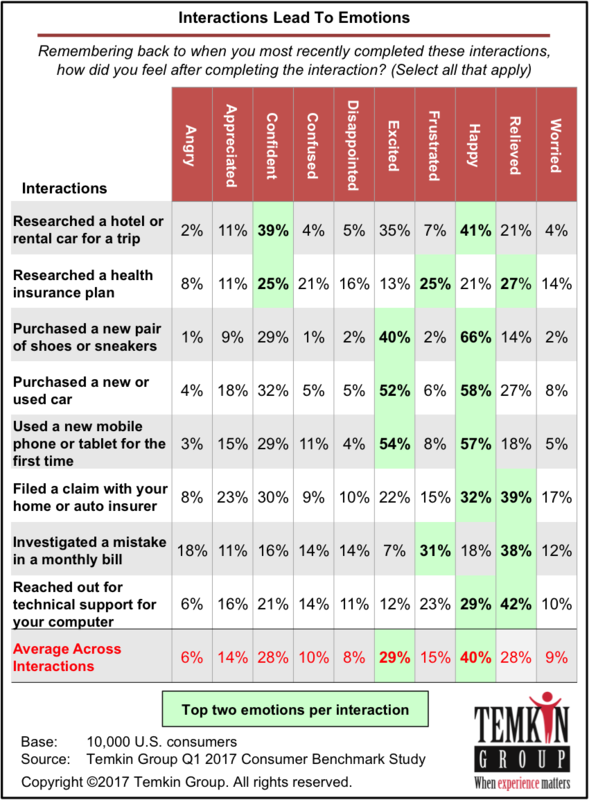 If you’re thinking about improving your organization’s customer experience next year (and why wouldn’t you be?!? ), then I hope you are also thinking about some changes in your organization’s culture. As I’ve said many, many times, your customer experience is a reflection of your culture and operating processes. It’s your culture that will sustain any improvements that you make in customer experience. That’s because how customers feel about an interaction has a significant impact on their loyalty to a company. So let’s talk about emotions. It’s time to start talking about emotions. 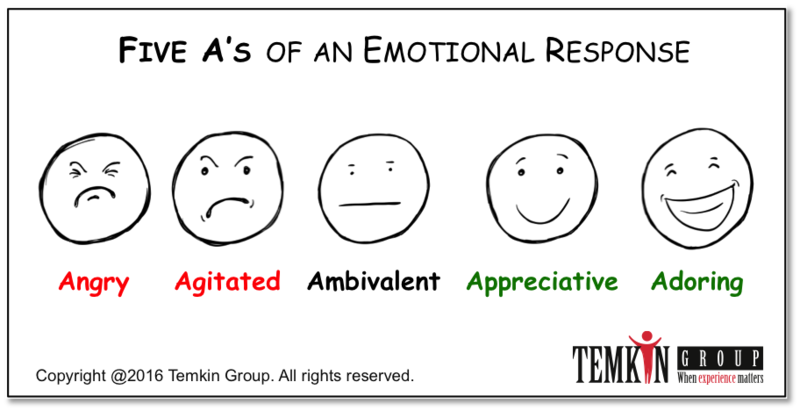 To help spur this dialogue, we introduced a new vocabulary that we call the Five A’s of an Emotional Response. Shahar, Ben, et al. “A Wait‐List Randomized Controlled Trial of Loving‐Kindness Meditation Programme for Self‐Criticism.” Clinical Psychology & Psychotherapy, vol. 22, no. 4, 2015, pp. 346-356. From the Abstract. Self-criticism is a vulnerability risk factor for a number of psychological disorders, and it predicts poor response to psychological and pharmacological treatments. In the current study, we evaluated the efﬁcacy of a loving-kindness meditation (LKM) programme designed to increase self-compassion in a sample of self-critical individuals. Thirty-eight individuals with high scores on the self-critical perfectionism subscale of the Dysfunctional Attitude Scale were randomized to an LKM condition (n=19) or a waitlist condition (n=19). In addition, being the very nature of "living reflections," my expressed opinions, ideas, and even conclusions may very well change over time and be "out of date" from those that I hold at present.